I’m a sucker for Christmas themed books and movies. Seriously, my DVR works overtime during the month of December. 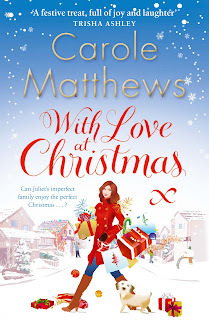 With Love at Christmas, by Carole Mathews, is sweet confection, as delightful as cookies and hot buttered rum by the fire (which is appropriate, because there are quite a few cocktails consumed in this funny tale). Most people fall into one of three categories during the holidays. There are those who truly believe in and embrace the joy of the season, even the craziness. There are also those who want to revel in the holiday, but life and circumstances have stripped them of hope. As for those who don’t believe in the spirit of the season, well, I refer them to the story of Scrooge. You’ll meet all three in this book and be reminded that it’s the season of goodwill towards all men, holiday miracles and happy endings. Set in London, With Love at Christmas is full of unique characters with their own views on the holiday, depending on their lot in life. Juliet is the matriarch of the Joyce family and absolutely adores Christmas. It’s her favorite time of year and she includes everyone (and then some) in her holiday celebration. The more, the merrier. Her husband Rick is more of the “bah humbug” variety, grumbling about the added expense and work. Juliet’s boss’s marriage is falling apart, and he confides all his troubles to her, creating complications. Rick is secretly helping a young woman and her child, who are living in a dire situation. He feels compelled to help, yet doesn’t know how to communicate this to his wife, who already has her hands full helping people. The extended Joyce family has complicated issues. They’re dealing with money troubles, aging parents, the death of a loved one, a wayward son, an unwed pregnant daughter and some marital-trust issues. This all is going on in the weeks leading up to Christmas! Yet Juliet is steadfast in her belief that family comes first and to always help those in need. In her case, more often than not, this means setting a place at the table and offering a warm bed. Rick and Juliet’s relationship is tested by their family and situation, but this is only part of the story. Family is at the heart of this book. We have the family we’re born into and the family we collect. More often than not, the two combine, creating one big headache…err, I mean, family. Juliet and Rick’s children got on my nerves. I was quite appalled by their selfishness regarding their parents. They acted like spoiled teenagers (they’re in their mid-20s). Juliet had no one to blame but herself. Regularly catching your son in flagrante delicto, under your roof, with a revolving door of bed partners (both male and female) and chalking it up to his free spirit? Letting your single, pregnant daughter, already a mum to a toddler, take advantage of you for round-the-clock babysitting while you work full time and take care of aging parents? I don’t think so! As a side note, this was my first e-book experience. I must confess…I was a bit wary. Just getting the “book” to my iPad was an ordeal (probably because I was kicking and screaming), but I did it. Three cheers for me! All in all, it was a good experience. However, I’m an emotional reader and I did have a weird moment. Once, when I was frustrated with Juliet’s children, I picked up the “book”, and banged it on my forehead…nailing myself with the iPad. Ouch! Good thing I wasn’t mad enough to throw it. I’ve since downloaded a few more books, which are only available in e-format, but truthfully I think I’ll always be a printed book type of gal. With Love at Christmas is a charming read that’s perfect for the holidays. Read it in preparation of the big day and it’ll help you keep your sense of humor about everything. Mathews has that comedic touch which makes a reader laugh. I also appreciated that the book dealt with some serious issues, yet it wasn’t somber. When I did cry, they were tears of joy, which are the best kind. Thanks to Carole for the e-book in exchange for an honest review. Who couldn't use a good holiday book to set the mood and make us laugh a bit? Thanks for your great review.